I hadn’t intended to do another video quite so soon, but Dutchie’s Cafe Table really deserved one and then I decided I might as well include a closer look at LOGO’s Jolie head and some Skin Fair items from alaskametro. I ramble on for quite a while, so I might as well leave off to the video right off! To check out the credits for the featured items and the rest of what I am wearing, see the end of the post. Right now, I seem to be moving from room to room in the Dungan Castle by Fanatik, setting up different scenes in different locations. This one started with the excellent Gothic Bench & Chair set by Fantavatar & Moonstruck for We Love Role-Play. Those pieces just had to be shown off in a castle, but I needed a bit more decor to make the scene come together. That’s when I turn to Paper Moon, especially the sets of tapestries. Those are superb for hanging on your castle walls and making rooms feel a bit more inhabited. You also see a glimpse of a piece from the gacha set “The Songs Ephemera” which are excellent little table settings for different characters. Between a whirlwind trip to Madrid for a book signing and interview and packing for our proper vacation, I haven’t had a chance to blog for a good while. As it happened, the wait led to a nice opportunity to pair up Roawenwood’s latest set with a new collaboration from Fallen Gods and Faida. It also allowed for some naughty shots, and I never turn down an opportunity for those. Feeling like you should be treated like royalty? Then you will want to take a look at my unboxing video for the Treasure Chest for March. Its theme is “Royal Treatment” and it includes 12 designers, each with their own interpretation of what that might be. The teaser photo reveals a few of the things you will find in the box, but to see all of the goodies you will have to watch the video. If you like what you see, the Treasure Chest now costs L$3000, but if you had signed up before the reveal it would have been L$1500, so keep that in mind for next month if you would like to give the only roleplay oriented subscription box on the grid a try. Given the scarcity of gorgeous male historical/fantasy clothing in Second Life (unless you’re a grungy barbarian), I am always really thrilled when I come across something that I know Ran will want for his avatar. One brand that is sure to never disappoint in that regard is Junbug’s male side brand/sub brand, fittingly named Heathcliff. 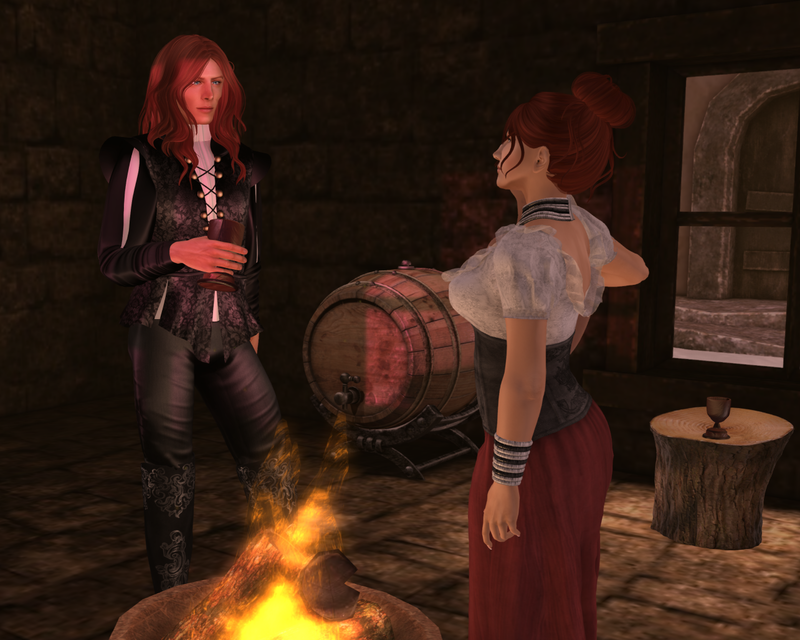 At the Fantasy Gacha Carnival, she has a gorgeous set of tunics and matching knee breeches which I promptly spent some money on and then passed over to Ran with orders for him to get dressed. 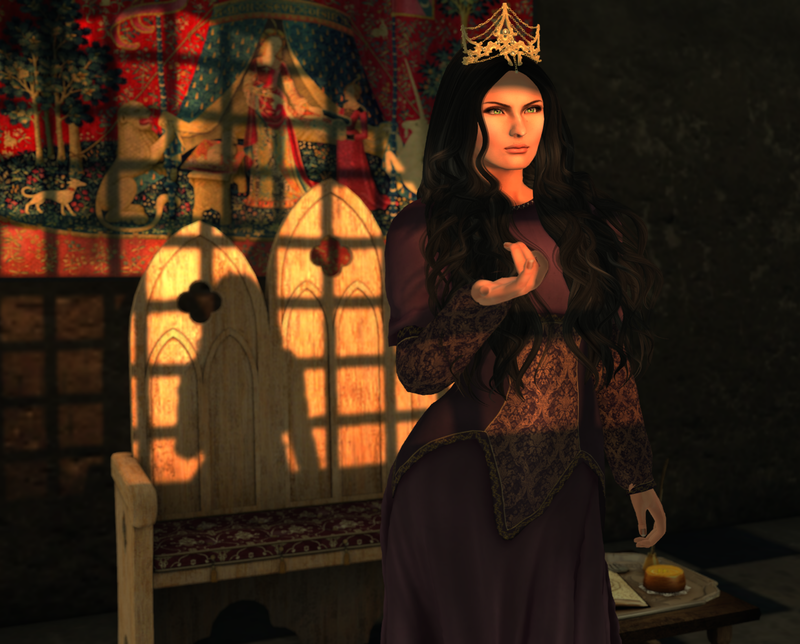 As it happened, I had a new dress to blog, so we made it a little scene in a tavern. The last two days it seems like half the grid (at least) have been trying to get into the Epiphany. And no wonder, really, because there are some very cool gachas this time around. I’ll be featuring just a taste of two of them in this post, the Terra Decor Gacha from the Plastik and the Cadeau, Costume Edition by Fallen Gods & Faida.